Jon Peltier, Bob Umlas, Roger Govier, Henk Vlootman, Oz du Soleil, Tony de Jonker, Jan Karel Pieterse. Learn how to Customize the ribbon for your workbooks and add-ins. Get insight how to Build Excel models based on ranges and positions. Get advice on Best practices in Power pivot. Excel MVP and charting Guru Jon Peltier teaches you how to visualize your numerical information in the most effective way. 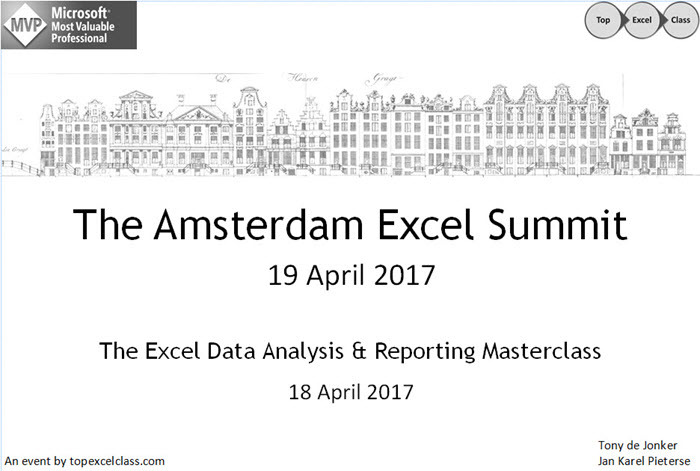 Excel MVP and financial expert Tony de Jonker and communication & visualization expert David Hoppe unveil the secrets of creating powerful and flexible dashboards. So head over to our website to register or to signup to our mailing list so we can keep you posted! I have just published a new tool today, Trusted Document Manager. This little tool enables you to manage your list of trusted documents. Currently, Excel only allows you to either leave the list intact, or delete the entire list. This means all of your currently trusted documents become untrusted again so you have to enable macro’s on all of them once again. The tool allows you to remove just one file, remove an entire folder or even an entire drive. Also it offers to possibility to remove files which no longer exist from the list.